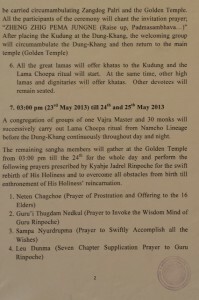 On 27 May, Tulku Thubsang Rinpoche commenced granting a series of empowerments. The first was Dor Sem with Torma. These shall continue the next few days, however not all will be open to the public. On 26 May, a procession of the remains from the Stupa took place going from the Golden Temple to the Tara Temple, where they have been ungoing examination and the creation of Tsa-Tsa for Stupa. A Stupa is to be constructed within Zangdokpelri Temple. 7 AM Monks to gather in temple while the masters go to the Chorten and check the fire. 9 AM Masters will join the monks in the temple and the Dung-rü ceremony will commence.